Soooo perfect, soooo Italian to me. It's amazing how you always seem to take pictures of people and settings that I thought only existed in my dreams. The feeling of your photographs is of a lost era that suddenly appears not so lost. Thank you for giving me that old world feeling every day! I'll have a bluuuuue Christmas! and his socks, such great hues in this ensemble! Agreed. That said, there are some (women) on the other end of the scale who buy their outerwear too small. Whether it is for vanity's sake (smaller sizes flatter the ego) or they don't take into account heavier cold-weather fabrics, coats that are a little too snug are never flattering. This gentleman obviously understands outerwear sizing, and bravo to him. Couldn't agree with you more Scott, including myself, but I like to think I have started to make a departure from that loose loose style. But I will say, Americans, paticularly men have a tendency to go loose in an effort to seek comfort of wearing fine clothing….and that is not limited to outerwear …its sports jackets, suit and especially dress shirts. Thanks as always for these inspirational photos and thought provoking too. you are so right, most people do purchase outerwear way too large. I LOVE a fitted jacket/coat. too chic and cute…i like it! damn those pants are gnarly. GOTTA HAVE IT. Oh, throw in the socks too. It is not surprise, Italians are to me the best dressed nation! Where are you going next?! I love his blue coat! But of course we can always have it altered by Ripense..
That's indeed a perfect coat. such a regal colour! I totally agree re: the nipped in waist. I also love the turnups on the trousers! 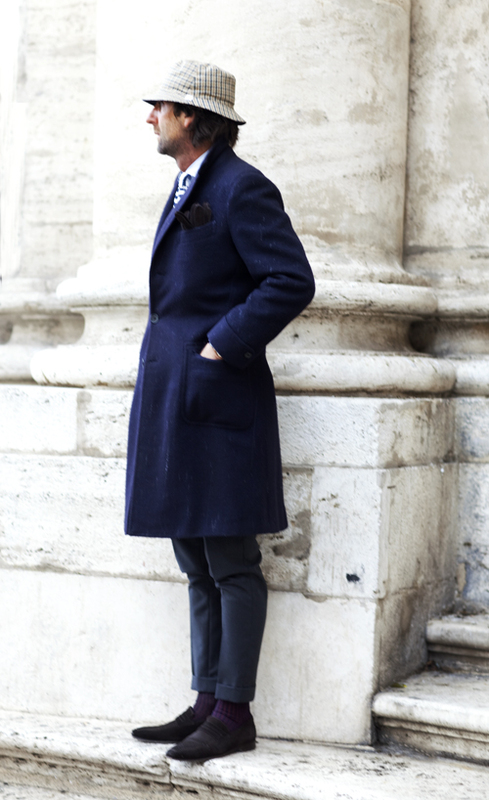 I love the combination of the colors from his coat to the shoes! How do we avoid buying outerwear slightly oversized? Tips to the masses? Do tell! He looks smart. I think that is the best word I can think of to describe him right now. I love the purple socks, but I would feel self-conscious showing them while standing. Plus my ankles would get cold! I love his hat and coat! Those socks are perfection. It is the slightest detail but I'm in love with them. AMAZING COAT!But I didn't like the hat. 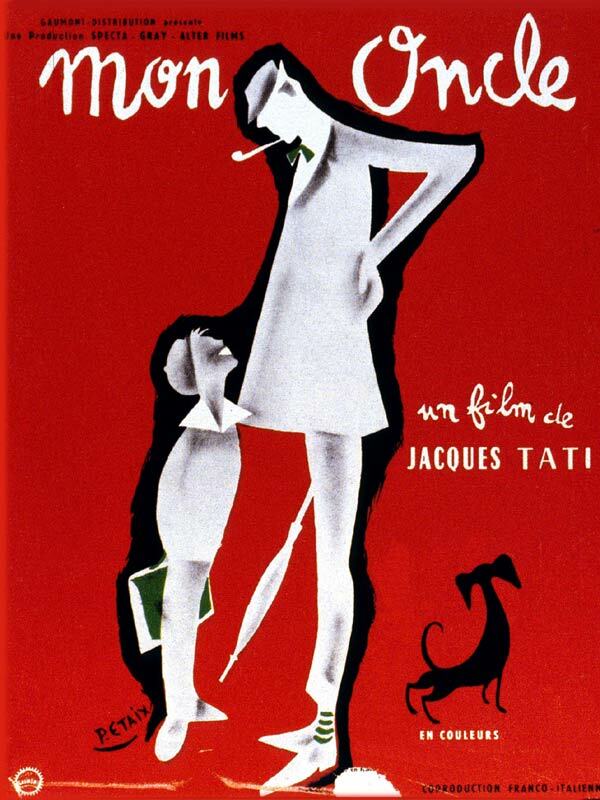 yes–mon oncle~ I thought of Jacques Tati, too. He must be going for that very look. Almost as adorable as the original. His coat is perfect! he wears it well! You speak the truth Scott, but how do you accommodate for the sweaters and suit jackets often needed for the northern climates? I love that coat+hat combination! Like everything except the hat. Perhaps a darker color would have been better. You may be right, I guess we associate bulk with warmth. I like the raindrops that are still sitting on the wool! c'est la classe! great photo! I agree absolutely, a heavier man in an oversized shirt/coat looks much more heavier then in a slim fit shirt/coat…and his look is gorgeous. I agree with your comment, I think most of us do buy outerwear a size too large. And in noticing that in myself, I've started buying coats in a more fitted size. The difference is spectacular! i agree the coat is perfect. Love his hat! Puts the entire look together. Yep I am guilty of buying outerwear too big. The blue really stands out and his strong stance says alot. About the oversized bit, I don't fully agree with you because when you go to Scandinavia…the oversized outwear is totally the thing out there. If you check out the streetwear pictures of Denmark, some girls are wearing gorgeous oversized coats which will make the Swedish girls jealous. you clearly don't live in chicago. Oh yeah! Although sometimes it's not only the size but the cut of the coat and how it fits to the body… this one fits perfect! Great! Yes I agree with you. The coat must be fit. With vintage coat is easier: they are so slim. nope totally wrong he looks like he shrank in the wash! As Italian as it gets! The bottom half – I laugh! My dad wears his pants (wide legged though!) grazing his ankles, and I always thought it was so uncool. But here, they're narrower, folded up, and show off purple socks. Insouciance?! Power to him! I must not be so narrow-minded: boldness & originality (in French, is it "je n' sais qoi"?) is a gift! I agree with you; for me it's so difficult to find ourwear not etralarge…. 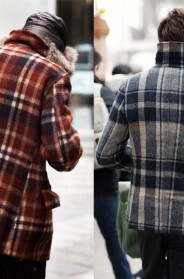 For a slim fitting coats with amazing cuts try and get your hands on jackets by Ato Matsumoto. Divine but hard to get hopld of unless you're in Japan. because one thinks bigger is warmer…but a more slim silhouette is so much nicer! BEAUTIFUL!!!!!!!!!!!!!!! What stunning colors and silhouette. Wish I could see more photos of this gentleman. I love your site Scott, but I don't agree with your theme of 'oversized' outerwear/jackets/pants… when I wear a coat, I (still) like to wrap myself up, despite all you've taught me. Yep he looks great… the architecture helps. Buying to oversized outwear isn't the worst thing we do. To small coat is worse. Outerwear fit and size is tricky. Men over, say 40 often wear their outer garments far too large, and I see a lot of younger men and women in too-tight coats. That's especially noticeable in a cold climate, where people bundle up in several layers come winter. Lvoe the dark violet socks and the matching of them with the shoes….So strange and beautiful!! Wow, he is such a gentleman. Everyone is invited to THE LOVELY SAN!!! I thought this was a YOUNG Harry Dean Stanton for a second. I met him when i was in Rome, his store, Sartorio ripense, is like an aladdin's cave of fine tailoring. I agree with what some people are saying. A small coat looks waaay worse than an oversized one. That said, This guy's coat looks very good. I'd like to know if he's got a sportcoat under there. But the goodness all ends at the hemline of his coat….what the hell is up with those super-tight trousers? They could use a bit of elastic at the bottom to go around the bottom of the foot and keep them from riding up! I absolutely agree, too many oversizes around! agreed. outerwear should fit you like a glove (which doesn't mean tight & unbreathable). besides clothes that fit properly are more efficient in their purpose: i.e. keeping warm, cold, etc. Mr Hulot by Jaque Tati! Emily is correct. We (Americans) usually do buy outerwear too large, but only for the sake of layering. Not sure what the alternative is unless you think we should only wear our skivvies under coats so we can get a slimmer fit. Besides the fit, the color is also well chosen! I agree to some extent about clothing being oversized but I suspect the pendulum has swung too far in the other direction. Coats are too short and too tight, and is three inches of visible sock really elegant?. Trust me their wearers will wince in 20 years time when they look at the photos. The seventies should have cured us of fashion extremes but apparently not. I really enjoy the colors here. A hint of purple at the feet and a sharp blue for the coat, wonderful. The color of the coat is perfect. Scott, thank you so much for talking about oversized coats. I couldn't agree more. There's a certain charm to it, when it's intentional, part of proportion-play…but it drives me nuts to see so many people walking around in coats which just don't fit. How many sweaters is one going to wear under there, really? i agree with you Scott about oversized outwear..
nothing like a dandy to brighten up my day! This man understands silhouette and really knows how to mix colors. The gloves tucked into the upper coat pocket is a nice touch. Apart from the hat this could well be a great outfit for a businessman, too. I am in investment banking and most men just buy clothes too big. lovely pic! it reminds me of a time when it was inmportant to men to dress well. This fascinates me. I wonder what his outfit, beneath the coat, is like. C'mon, the socks win here. The coat's nice but he should get his hands out of his pockets or he'll stretch them. I often get young men buying women's jackets and coats in my shop and they look simply fantastic! Not at all like they are wearing women's clothing, either. What about those pants in combination with the moccasins. Great choice, great style. 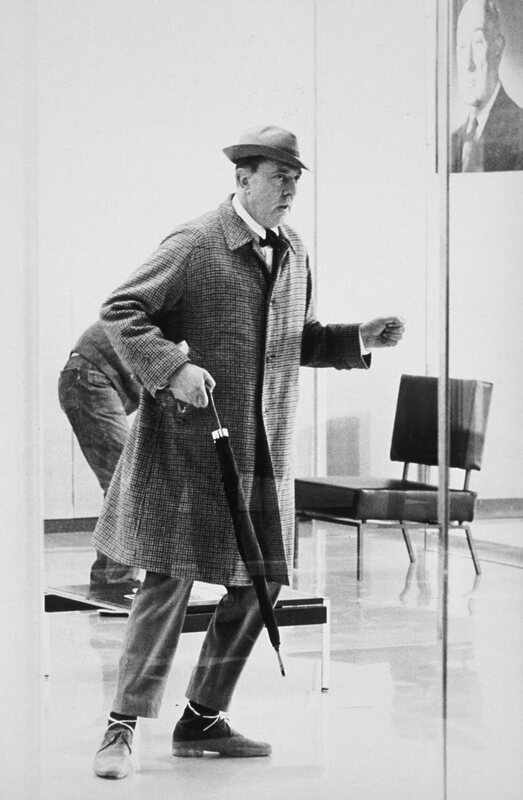 He's definitely channeling film director Jacques Tati. Check these photos out. Love the look.